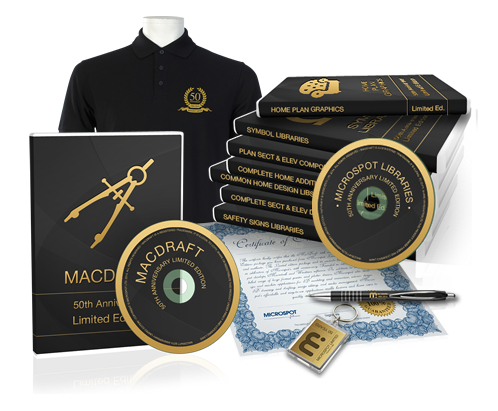 [prMac.com] Maidstone, United Kingdom - Microspot Ltd. is celebrating their 50th anniversary and to celebrate, today the company announces the 50th anniversary limited edition package of MacDraft Professional, their 2D Drafting, Design and Illustration software. With this limited edition pack you'll be drawing faster, more efficiently and with more confidence and the exclusive merchandise will bring you ever closer to the Microspot team and their celebrations. Now OSX Yosemite compatible, the limited edition package brings together the power of MacDraft Pro 6.1.1, seven of the most popular vector symbol libraries plus lots of exclusive merchandise all in one affordable limited edition pack. Faster Drawing: By combining all of our libraries into this one package users can now save hours of drawing time by using any of our pre drawn vector graphics to complete their plans, drawings or illustrations. With MacDraft's easy to use library palette, simply drag and drop over 4500 different items into your document to create vibrant, detailed and complete drawings. Feel Part Of The Team: Microspot Ltd has been running for 50 years now and we owe a huge part of that to our devoted customers. MacDraft in particular has undergone so many improvements over its lifetime and a lot of that is down to customer feedback. So to celebrate our 50 year success we are including exclusive merchandise in the form of a branded Polo-Shirt, Acrylic Keyring and Logo Printed Pen inside the Limited Edition pack. This means you'll soon be the proud owner of a limited edition MacDraft package and take advantage of the exclusive merchandise, to help us achieve another 50 years of success. Make History: In celebration of this milestone we have rebranded the MacDraft Pro box product and created a single library package, all exquisitely detailed in 50th anniversary black and gold. This product sits beautifully alongside the limited edition t-shirt which boasts a glamorous golden stitched Microspot emblem, a black gold and silver retractable ball point pen and of course the anniversary key ring. All of this combined creates an exclusive package available for a limited time only. Microspot MacDraft Limited Edition Package is available only from the Microspot web store. Microspot MacDraft Limited Edition Package has a retail price of $499.00 USD (GBP 349.00 or Euro 399.00). There are also various upgrade options available from the website, simply visit Microspot online for more information. Founded in 1964, Microspot develops Macintosh and Windows software for 3D modeling and animation, interior design, 2D drawing and drafting, image editing, and media management. Microspot offers affordable, easy-to-use software that produces professional results. Its customers are business and home users worldwide. Copyright (C) 1964-2015 Microspot Ltd. All Rights Reserved. Apple, the Apple logo, Macintosh and Mac OS X are registered trademarks of Apple Inc. in the U.S. and/or other countries.